For the last two days we’ve been in Austin “installing” The Stepping Up and Going Under Method for the Intersections show that is opening today at the Creative Research Lab. 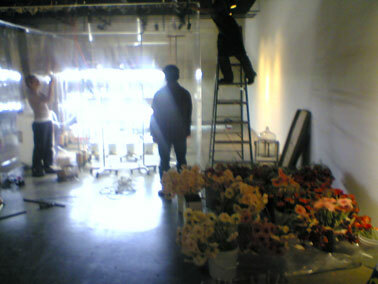 The picture above shows Murray (middle) talking to Meggie Chou (on ladder) in front of her new installation, Incubation Machine 2.2. Our installation for this show is minimal: two videos on two monitors. We’re simultaneously loving the easy installation process (load dvd, adjust monitor, repeat) and missing the visual impact of an installation — which the other three artists are working on, probably even now, 8 hours before the opening. Murray is having some guilt about this and is taking an unusually long time calibrating those monitors and setting the volume.